A major risk to riders is when drivers turn left at intersections without observing that that there is an adjacent bicycle which is travelling straight ahead. 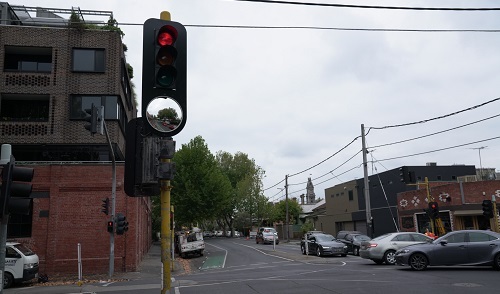 VicRoads is trialling the low cost safety treatment at two intersections in Collingwood – one at the corner Wellington Street and Langridge Street, and another at the corner of Nicholson Street and Gipps Street. 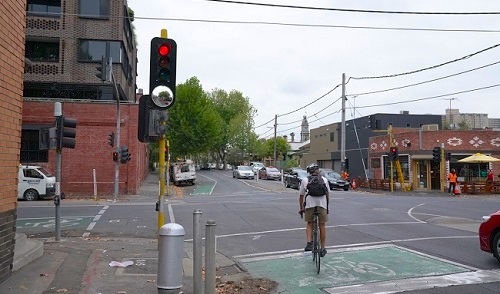 "When vehicles are preparing to turn left at an intersection, cyclists can often be within drivers’ blind spots”, VicRoads says. "By installing convex mirrors below traffic light lanterns at the four corners of these intersections, we aims to increase drivers’ awareness of cyclists travelling behind and alongside them in the bicycle lanes. "Signalised intersections are high-risk areas for cyclists, given their lack of physical protection and the number vehicles moving in different directions." The Blind Spot Mirror pilot is funded through the $35 million Safe Travel in Local Streets program, and forms part of the Victorian Government’s Towards Zero Road Safety Strategy, to achieve fewer than 200 deaths and a decrease in serious injuries by 15 per cent on our roads by 2020. The Safe Travel in Local Streets program is expected to prevent a total of 129 serious injuries over its 15-year life span.